Brazilian artist Henrique Oliveira creates sculptures, paintings and large-scale installations with violent organic aesthetics. 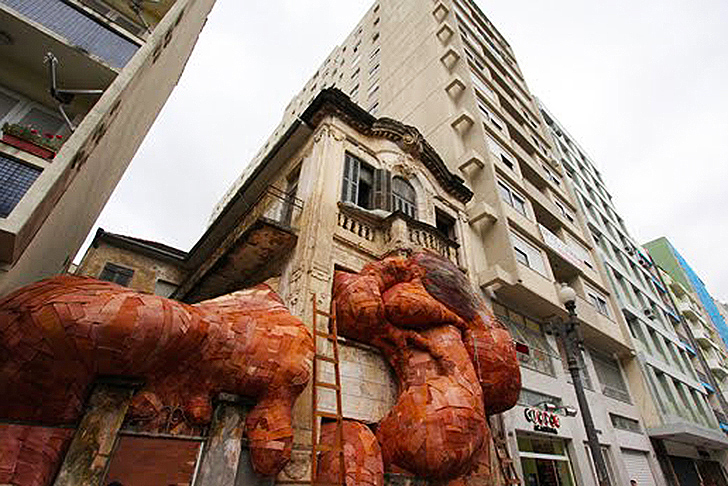 For Casa dos Leões, a work created for the VII Bienal do Mercosul in Porto Alegre, he turned an entire house into a sculpture with growing tumor-like blobs popping out. The 'tapumes' peeled wood installation is made from old recycled plywood and it draws inspiration from medical textbooks and physical pathologies. Henrique Oliveira holds a degree in painting but his work is an exploration on three-dimensional constructions and temporary installations. 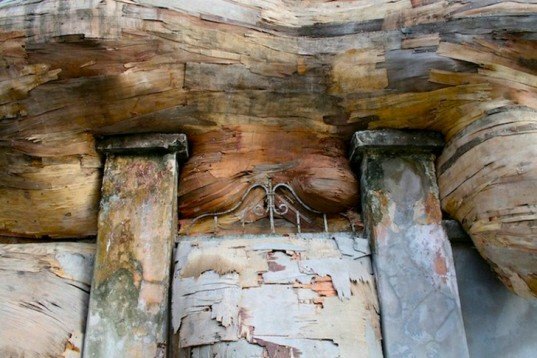 He was a student in São Paulo when he spotted a plywood fence outside his window beginning to peel and fading into different layers creating beautiful shades and patterns. That acted as a source of inspiration for his whole work, which is characterized by organic and peeled shapes that seem to grow in a violent way. The use of recycled materials found locally is Oliveira’s trademark. He uses old plywood, recycled fencing and other woods found in dumpsters and landfills near his home in São Paulo, onto (toxic) PVC as a support. The undulating shapes are taken from medical textbooks and are especially reminiscent of physical pathologies such as tumors. Henrique Oliveira holds a degree in painting but his work comprises an exploration of three-dimensional constructions and temporary installations. He was a student in São Paulo when he spotted the plywood fence outside his window beginning to peel and fading into different layers creating beautiful shades and patterns. That acted as a source of inspiration for his whole work, which is characterized by organic and peeled shapes that seem to grow in a violent way. The use of recycled, locally-sourced materials is Oliveira's trademark. He uses old plywood, recycled fencing and other woods found in dumpsters and landfills near his home in São Paulo, onto (toxic) PVC as a support. The undulating shapes are taken from medical textbooks, and are especially reminiscent of physical pathologies such as tumors.